After yielding a 3-1 lead in the final six minutes of regulation, BU defeated North Dakota at the 11:48 mark of the second overtime (91:48 overall). Clayton Keller controlled the puck on the left side of the UND zone, drawing a crowd and then wired a pass to Charlie McAvoy breaking to the net for a thrilling 4-3 win. Jake Oettinger stopped 56 Fighting Hawks shots in a heroic performance deserving of all three stars. BU survived not only 59 shots by the Fighting Hawks, but also an apparent game-winner that was disallowed after a review due to an offside. With the win, BU advances to Saturday’s Regional Final against Minnesota Duluth. 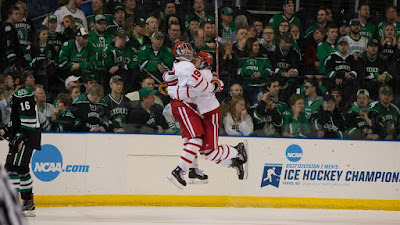 The Bulldogs, whom the Terriers defeated in the 2015 Regional Final, also won in overtime, 3-2, after Ohio State had rallied with two third-period goals to tie the score. Game time is 6 p.m. ET and the contest will air on ESPNU. North Dakota scored the first-period’s only goal when Rhett Gardner skated across the crease and pulled a puck past Oettinger. BU matched that score in the second on senior captain Doyle Somerby’s first goal of the season, a sharp angle shot following a cross ice pass by McAvoy. Early in the third period, BU took the lead when Jordan Greenway fed Keller behind the net and the freshman centered the puck to Bobo Carpenter for a bang-bang shot past Cam Johnson. Four minutes later, Patrick Harper saucered a pass over a UND stick to send Jakob Forsbacka Karlsson in alone and the Swedish center beat Johnson five-hole for a 3-1 advantage. Midway through the period, a heavy hit on Kieffer Bellows shattered a pane of glass, causing a lengthy delay that proved to help North Dakota more than BU. At 12:14 Ludvig Hoff scored off a well-executed face-off play to cut the Terrier lead to one. Three minutes later, that lead disappeared when Christian Wolanin got behind the BU defense and beat Oettinger in close. At 3:48 of the first overtime UND's Dixon Bowen scored what appeared to be the game-winner, but after a lengthy review, the call was reversed due to an offside. BU’s best chance in the first overtime came when Bellows batted a puck out of the air and off the post to Johnson’s left. Shortly before McAvoy’s game-winner, the sophomore defenseman drove down the left side and set up Nick Roberto for a close-in try that Johnson snuffed. Terriers blocked 51 North Dakota shots, 17 by junior Brandon Hickey. ● Celebration: What a feeling! For the second time in three years, we’ll meet @UMDMensHockey in an NCAA regional final. 2017 recruit Hank Crone scored his 23rd goal in Fargo’s 4-3 loss to Muskegon.